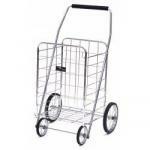 The Jumbo Folding Shopping Cart should simply be called the Jumbo Folding Cart. It has so many uses beyond shopping. In fact, I'm not sure that shopping- or at least grocery shopping- is even the best use for the cart. 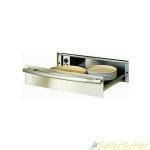 The SmartBargains Kitchen Utility Cart offers many accessories to aid in the function of a home kitchen. The cart includes a knife block, a cutting board, and two lower storage shelves. Beech wood construction is complemented by a beech wood finish.